Bantay Kalikasan with Environmental Group Baguio during the study tour at La Mesa Ecopark. Sitio Pungayan, a factual name of the fictional “La Presa” of infamous Kapamilya Teleserye “Forevermore” starring Liza Soberano and Enrique Gil is located at Mt. Kabuyao, Tuba, Benguet. The popularity of the program brought a hasty commercialization and business ventures around the localities. The majestic beauty of the area is being threatened. In upholding its mission on environmental protection, ABS-CBN Lingkod Kapamilya Foundation holds green initiatives to bring back “La Presa” into a greener community. 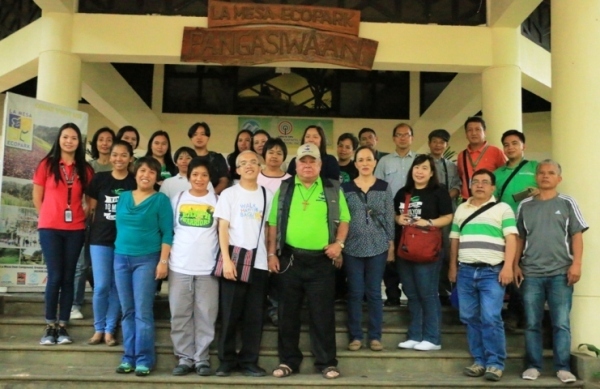 Environmental groups from Baguio composed of environmentalists, Bishop Carlito Cenzon, and DENR OIC for Central Baguio, Rainier Balbuena, recently gathered with Bantay Kalikasan at La Mesa Ecopark & Watershed for a study tour on sustainable ecosystem. The group also planted germinants at the nursery of the Watershed. A quick journey at La Mesa EcoPark and Watershed as well as a presentation on Water Conservation had helped the group to yield a necessary action plan for Sto. Tomas Watershed- the source of water-scarce in Baguio where “La Presa” is located. The group left the Metro with a grateful heart and a fertile mind, enough to bring their knowledge for a greener North.